One aspect of my job as a tour guide is to know everything. Literally. I don’t always succeed at that, but one question I can at least begin to answer is where a visitor might find interesting fabrics, threads, wools and trimmings as I am a keen dressmaker. 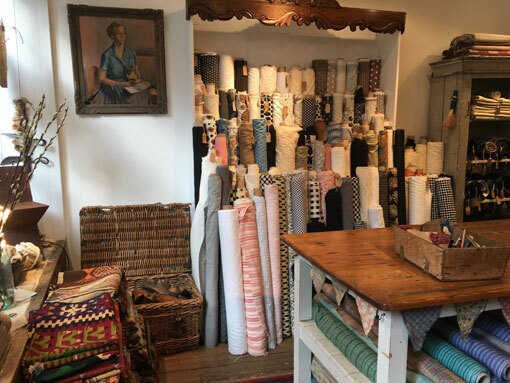 I am also someone who treats fabric shops the way some people treat art galleries – I like to go and just look, to enjoy all the colours, patterns and textures. Like all keen needleworkers, I probably have enough fabrics stored away at home to last me a lifetime, but there’s no harm in looking! So let’s start where most visitors to the UK start – in London. 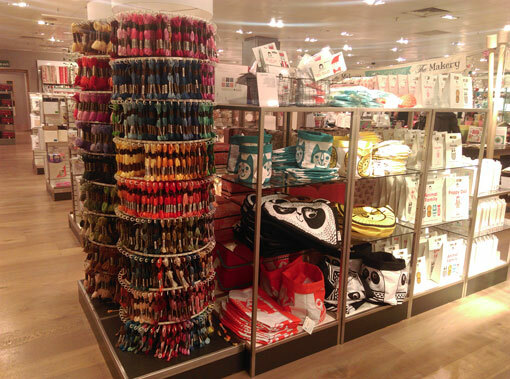 There are two department stores that most Londoners would head to if they needed something for sewing or knitting, John Lewis and Liberty. 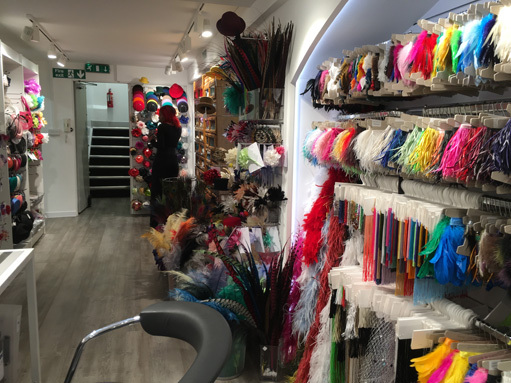 John Lewis, on Oxford Street, has a reasonably comprehensive selection of all that you might need for needlecrafts, but you probably won’t die of excitement. 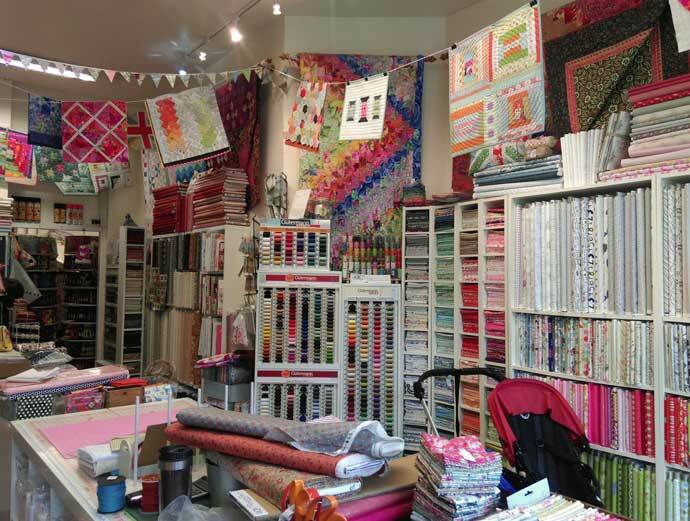 You’ll find everything from craft fabrics to wools to tapestry kits as well as threads, thimbles, scissors etc. Liberty, just off Oxford Street, is a famous name. I expect anyone reading this has heard of Liberty Prints – fine cotton, silk and wool fabrics with usually a small floral print, and instantly recognisable. The cottons are perfect for patchwork. 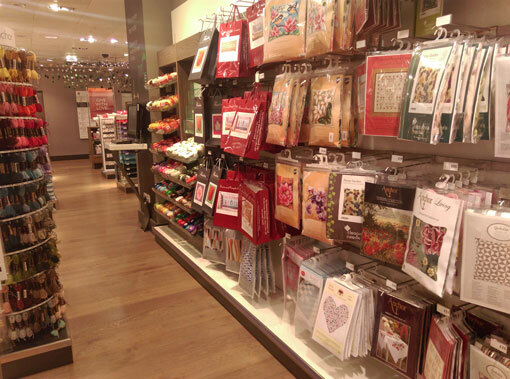 As well as the fabrics, Liberty has an interesting selection of tapestry and embroidery threads & kits. It’s a beautiful building full of rather beautiful things, so lots else to look at while there. Not far from Liberty, south of Oxford Street in Soho, is Berwick Street. Parts of this street are being rebuilt as I write (early 2017), and shops come and go, but this is the best street in central London for a concentration of shops selling luxury dress fabrics, as well as fabrics to interest quilters and patchworkers. It’s a street where you might find buyers from theatre costume departments, or dressmakers looking for bridal silks, or even students from the nearby London College of Fashion. 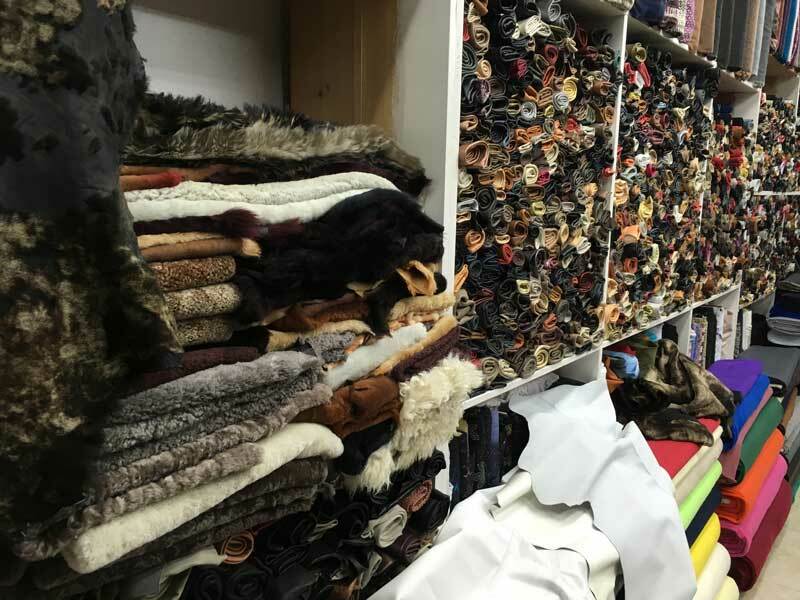 Some shops specialise – silks, suiting fabrics – while others have an eclectic mix that includes PVCs, leather and fur, and print collections. Just to add to the colour, there’s often a vegetable market down the centre of the street. 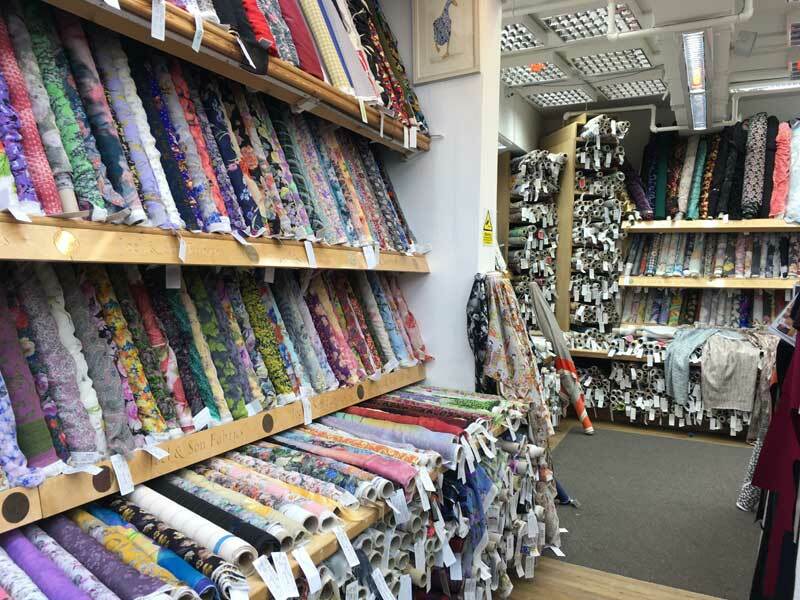 A short walk from Edgware Road station, and seemingly straying away from the familiar territory of central London, is Joel & Son Fabrics on Church Street. 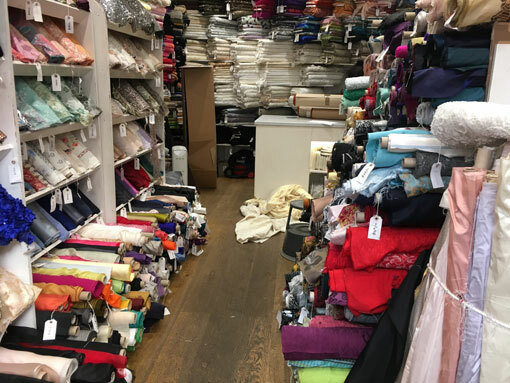 Another market street – but here, surrounded by cabbages and cheap kitchenwares, is probably the most luxurious fabric shop in London. 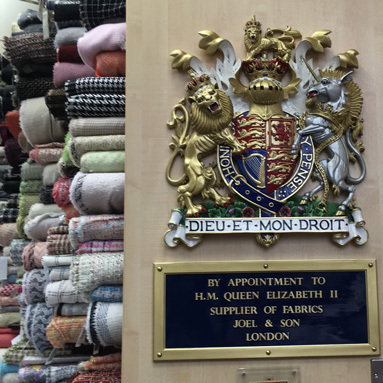 As you walk through the door, leaving the smell of cabbages behind you, the first thing you see is the Royal Warrant or coat of arms, telling you that this company supplies the Queen (or more likely, the Queen’s dressmakers). It doesn’t take long to spot all the designer names on the rolls of fabric. This shop is a joy to explore – and a little further down the road are quite a few interesting antique dealers. You might also spot fabrics on some of the market stalls. 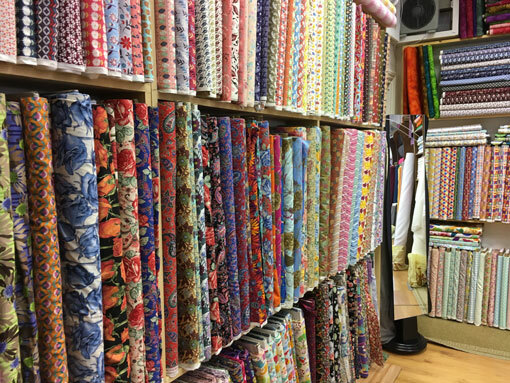 In an area that has many popular hotels, Gloucester Road, Shaukat on the Old Brompton Road has an enormous collection of Liberty Prints – larger than Liberty itself – on every type of fabric, some of which are no longer available elsewhere. For patchworkers, it sells bundles of colour-matched fabrics. For haberdashery, I have some favourite specialist shops. The Button Queen on Marylebone Lane, just north of Oxford Street, is somewhere you might buy some buttons and then make an outfit to match them. VV Rouleaux, further along the same street, is a very distinctive haberdasher. Barnett Lawson, another haberdasher, fills the basement of what appears to be an office building in Little Portland Street with all types of treasures. And Klein’s is in Noel Street, just off Berwick Street in Soho. McCulloch & Wallis on Poland Street is another shop familiar to London stitchers. 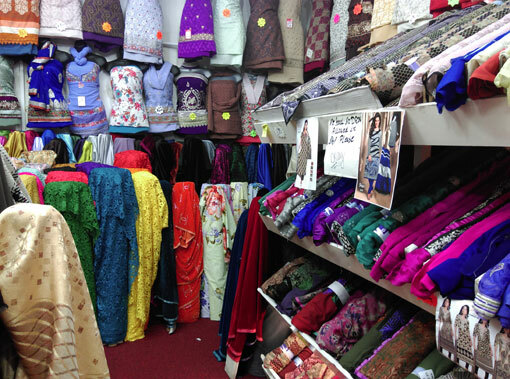 Its shop is a front for its vast fabric stock, so a lot of what is available is only represented by samples. 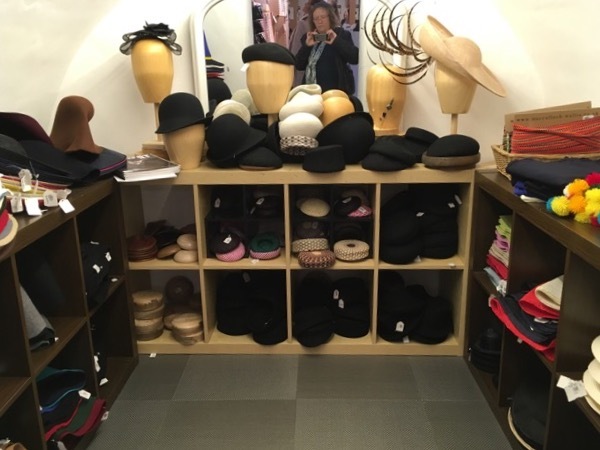 It has an extensive haberdashery section, including millinery supplies. 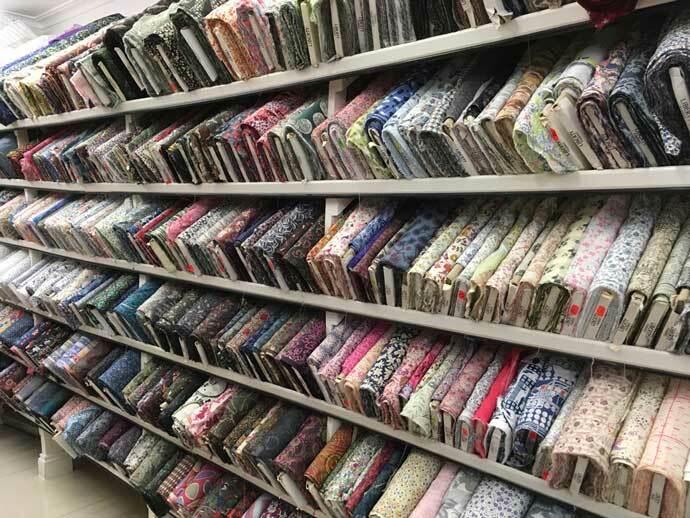 For anyone who doesn’t mind a little adventure, and is happy to stray away from central London, then one of the best places to shop for fabric in London is Goldhawk Road. This is where you’ll find the fashion students & young designers (many thanks to the young man who allowed me to take his photo) – and fabric from all over the world at anything from market to luxury prices. 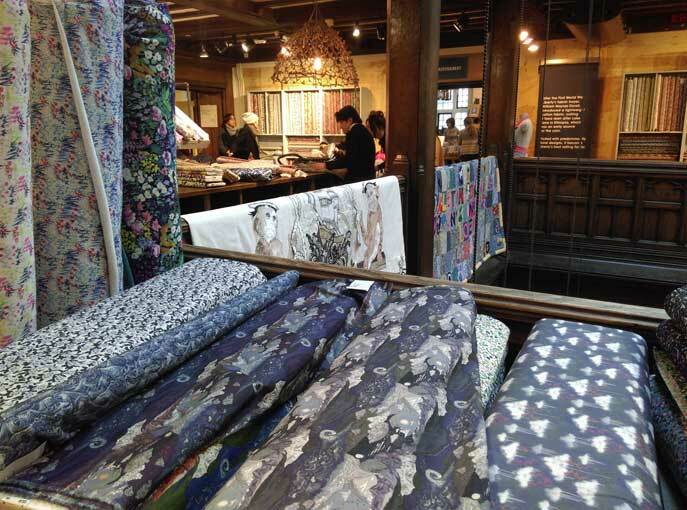 The shops vary enormously – some are start-ups with a few rolls propped up in a corner, while others are established luxury fabric suppliers. There are shops selling nothing but African or Indian fabrics, or silk specialists, and others that sell craft as well as dressmaking fabrics. One or two also have designer fabrics. 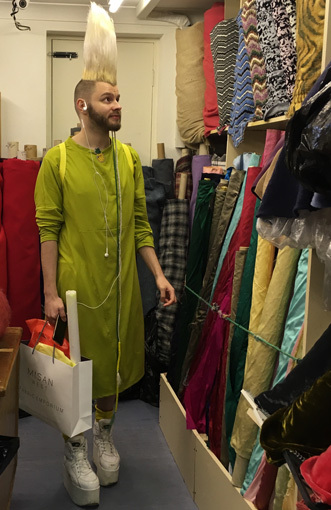 In the 300 metres/quarter of a mile from Goldhawk Road Underground station to Shepherds Bush Green there are probably 20 fabric shops. I LOVE fabrics, but even I can tire of going into every one!! But as a Londoner, this is where I buy many of the fabrics I use. Another place I regularly visit is Walthamstow Market. Out on the Victoria Line in east London, this market claims to be the longest in the world. But it’s not the market I suggest you look at, but the fabric shops along the High Street where the market is situated. It’s a long street, and some of the best shops are quite a long way down from the station, but I always find something worthwhile here. Lots of Indian and African fabrics, a small number of haberdashery outlets, and some fairly unique things on sale. Some patchwork and quilting fabrics and threads too. 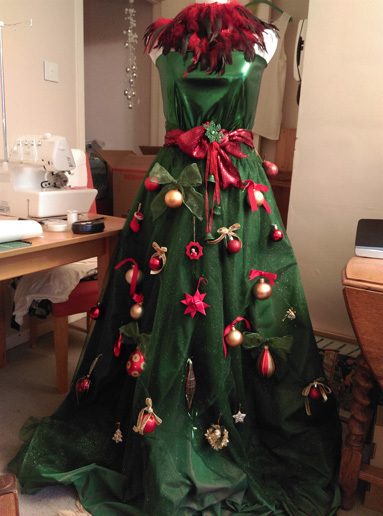 Walthamstow market is where I bought, very cheaply, everything I needed to make my “Christmas tree” a couple of years ago – inspired by photos I’d seen from the fashion houses of Milan. Specialist shops can be found all over London. 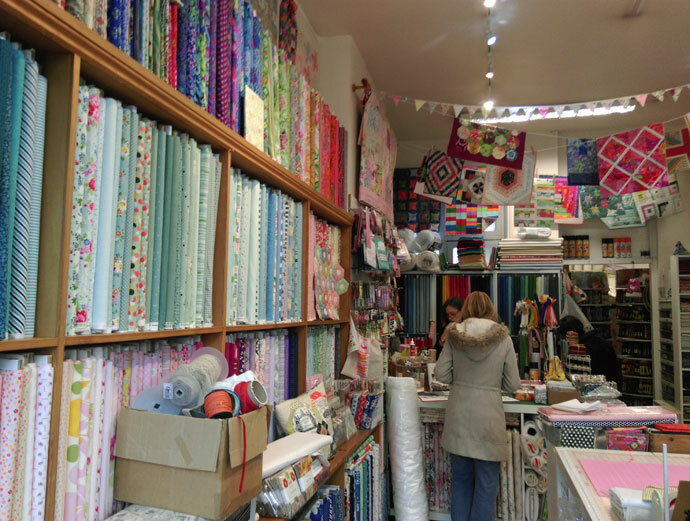 If you are going to Kew Gardens, for instance, there’s a small shop specialising in patchwork supplies not far from the station, Tikki London in Sandycombe Road. If you’re passing then it’s certainly worth a look. 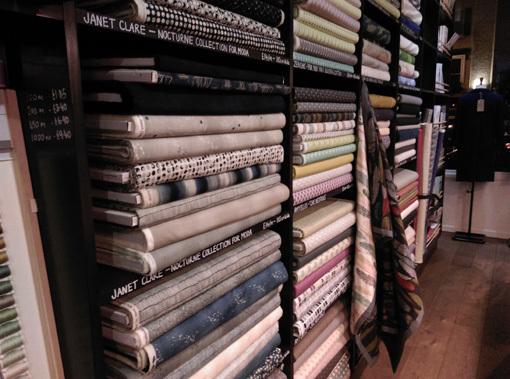 Similarly, if you are going antique-hunting in Camden Passage, Islington, then Ray Stitch on Essex Road has some great patchwork fabrics, or for knitters, Loop on Camden Passage itself is a lovely shop. 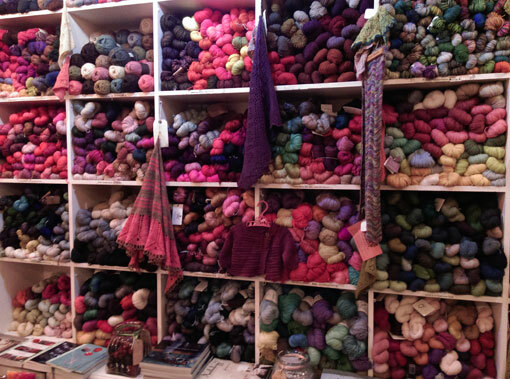 London has some great museums for people who enjoy needlecrafts and fabrics. The V&A (Victoria & Albert Museum, South Kensington) is the obvious starting point, as its permanent collections cover quilting, patchwork, embroidery, textiles and fashion. Recent temporary exhibitions have included ‘The Fabric of India”, “Opus Anglicanum: Masterpieces of English Medieval Embroidery”, and “Alexander McQueen”. Opening soon (27 May 2017) is an exhibition of the work of Spanish couturier Cristóbal Balenciaga. I always enjoy looking at textiles in the National Gallery – not the real things, of course, but the wonderful paintings of people wearing extravagant and luxurious clothes. For the real thing, go to the Fashion and Textile Museum in Bermondsey Street, just south of London Bridge. Exhibitions vary, sometimes focusing on detail and sometimes on a designer – Josef Frank’s Textiles until early May 2017 along with smaller displays about textiles, and then the next major exhibition from late May 2017 is Anna Sui, the American fashion designer. While you’re in that area you might also like to visit Borough Market, central London’s fabulous food market, for lunch. There are a number of trade shows that visitors might enjoy. In London the best are held at Excel and Alexandra Palace, and nationally at the NEC (National Exhibition Centre). 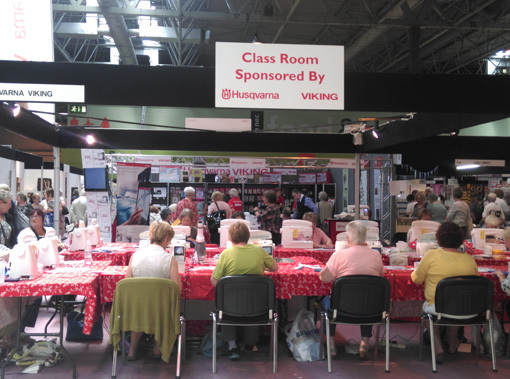 They go under names like “Knitting & Stitching” or “The Festival of Quilts”, and are easily found on the internet. For anyone touring further afield than London, Bath has a wonderful Fashion Museum. It also has an acclaimed collection of quilts and textiles at the American Museum on the edge of the city at Claverton. 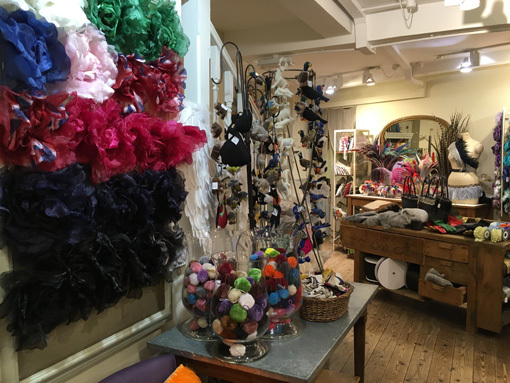 Country Threads in Pierrepont Place is a wonderful shop, particularly for patchwork and crafts.